Undertaking a research project can be a daunting task for early years students. This step-by-step guide clearly shows you how to organize and structure your project, write a literature review, interpret findings, and successfully present your research. Bringing the whole process to life through practical examples and real case studies, the book is packed with summaries, key points, checklists, and discussion topics, encouraging you to engage with and reflect on your own work. New chapters on writing your literature review and structuring your final project Increased coverage of e-research data collection methods New real-life student examples and case studies from the UK and internationally Additional online 'top tips' videos from the author. This is an essential companion for students on undergraduate and postgraduate early childhood courses, teacher education, nursing, and social sciences. It is also useful for early years practitioners required to carry out small-scale research. Dr. Guy Roberts-Holmes is Senior Lecturer in Early Childhood Education at the Institute of Education, University of London. 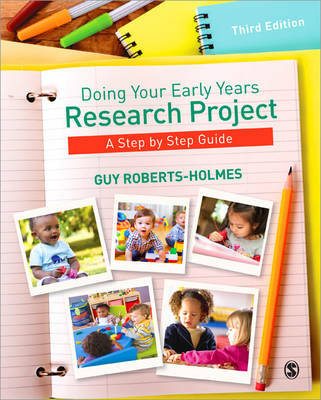 Guy Roberts-Holmes will be discussing key ideas from Doing Your Early Years Research Project: A Step by Step Guide in the SAGE Early Years Masterclass, a free professional development experience hosted by Kathy Brodie. To sign up, or for more information, click here.